As I created this site, I was reminded that not everyone out there is a model train expert. Hell, I've been doing it for 15 years and I don't consider myself an expert either. Some people may find this site very interesting, but they may have a hard time understanding all the "lingo". So, I am slowly putting this FAQ page together to help folks that are new to this hobby. If you have any questions that you can't find an answer to on this page, just ask me! 1. I've seen a car/engine/accessory on your site that I really like. Where can I get one? 2. What do the terms "tinplate" and/or "prewar" mean? 3. What's the difference between O-Gauge and O-Scale? 4. What does "postwar" mean? 5. I hear all these terms like "O, O-27, O-31, O-36, O-45" etc. What do these terms mean? 6. What is a "truck"? 7. How many companies make O-gauge trains? 8. How many companies make O-gauge accessories? 9. Who makes the best O-gauge trains and accessories? 10. What type of track do I use on my layout? 11. What size of curves does your current layout use? 12. What sort of scenic supplies do you use? 13. What transformers/power supplies do you recommend? 14. I'm new to this hobby and I want to get a train for myself or my child. Where do I start? 15. I like one or more of your train photos and/or videos and would like to use it for my own purposes. Is that allowed? 16. How do you afford all this stuff? What do you do for a living? 17. I would really like to come see your layout in person. Do you allow this? 18. What's the best way for me to get in contact with Eric? Q: I've seen a car/engine/accessory on your site that I really like. Where can I get one? A: If you've seen a postwar item on my site that you like, try looking on ebay. There's a good bet you'll find it eventually, if not right away. If you see a newer Lionel item on my site that you like, again try ebay. Lionel has no central finder system, so ebay is usually going to be the best bet. It's either that or start calling random dealers. If you see an MTH item on my site that catches your fancy, you're in luck. MTH has an outstanding product locator on their website. Using the locator, you can instantly find out the names of any and all dealers that have that particular item in stock! You'll be given a full list of dealers that have your item, complete with all of that dealer's contact information. I have found loads of MTH stuff this way. You can find their product locator tool right on their home page at http://www.mthtrains.com. If you know the exact model number, use the advanced search tool for instant gratification. Once you find the item your looking for, click the "Find It" button to find out who has it in stock. If you come across an item that is no longer in stock with any MTH dealer, try ebay as a last resort and see what it turns up. For Atlas stuff, you can either try their website or ebay. Q: What do the terms "tinplate" and/or "prewar" mean? A: While some people will use the term "tinplate trains" a little loosely, the term generally refers to the style of trains that were made my Lionel, American Flyer, Ives and others in the 1920's and 1930's. Another popular name for these types of train is "prewar". In other words, trains made before World War II. Tinplate trains were not really meant to be very realistic looking, but instead to be more like caricatures of real trains. They were made of stamped sheet metal and painted in bright shiny colors. They were more "toy like" and they are prized by some for that characteristic. There are generally to types of tinplate trains: O-Gauge and Standard Gauge. O-Gauge tinplate trains will run on O-gauge track just like any other O-Gauge train you may have. The O-Gauge tinplate trains, however, do have a different style of coupler than regular O-Gauge trains, so they are not compatible. Standard Gauge tinplate trains run on Standard Gauge track, which is 2 1/8 inches wide. There is no right or wrong when choosing whether to go with O-Gauge or Standard Gauge. It's just a matter of choice. The one advantage of going with O-Gauge tinplate trains, however, is that you can run them on your existing O-Gauge layout. New tinplate trains can still be found. MTH has been making their "Tinplate Traditions" line of trains since the 1990's. In 2009, MTH teamed up with Lionel to create the Lionel Corporation. The new Lionel Corporation allows MTH to make tinplate trains that now bear the original Lionel logos and nameplates. If you've never thought about getting into tinplate train before, there's no better time to dive in than now. Click here to see my tinplate trains. Q: What's the difference between O-Gauge and O-scale? A: Although these terms are often used interchangeably, there actually is a difference. O-Gauge simply refers to any model trains which ride on tracks where the outer rails are 1.25 inches apart. That said, there are 2 main divisions within the O-Gauge hobby. O-Scale refers to O-Gauge trains that are built to scale in order to closely match the real-life prototypes. American O-Scale trains are usually built to 1:48 scale, which means that 1 inch on O-Scale is the equivalent of 48 inches (4 feet) of the real-life counterpart. European O-Scale trains, which have been gaining popularity in America in recent years, are usually built to either 1:48, 1:45 or 1:43 scale. Because O-Scale trains are quite large, they require wider curves to function correctly and look realistic. What this means is that O-Scale trains, while more realistic looking, take up more space. What about O-gauge trains that are NOT built to scale? These fall into a separate category called O-27. O-27 trains are the "classic" O-Gauge trains that Lionel made famous back in the days after World War II and which are still very popular today. O-27 trains are usually slightly smaller than O-Scale trains and are easier to fit into a small space since they do not require the wide curves that the larger O-Scale trains do. When walking into an O-Gauge train store, you will probably notice that some O-Gauge trains are smaller than others. This can often be confusing, but now you know that you're actually seeing 2 different types of O-Gauge trains: O-Scale and O-27. It usually won't look right if you mix O-27 trains with O-Scale trains on the same layout, so think carefully about what you really want before you make your first purchase. Determining which direction you want to go in is strictly up to you. Some people enjoy the more toy-like look and feel of O-27 trains, while others strive for realism and go for O-Scale trains instead. Some people base their decision on the amount of space they have to work with. And of course, some people dabble in both O-27 and O-Gauge (though they will usually keep each on a separate layout from the other. Keep in mind that what you've just read are only suggestions. There are no "rules" and whichever direction to choose to go in, you're in store for years of enjoyment and excitement! Q: What does "postwar" mean? A: The term "postwar" refers to the era of Lionel trains following the end of World War II, spanning from 1945 to about 1969. Hence the term "postwar". In contrast, the era of Lionel trains prior to World War II is known as "prewar". Prewar trains tended to be more toy-like while postwar trains were more realistic looking. Postwar Lionel trains were made in the USA and the craftsmanship and quality was second to none. This was the golden age for electric trains and pretty much anything from the postwar era is a collectors item. Some postwar Lionel trains that are still in good condition can be worth a good chunk of change. After 1969, Lionel's quality went down and the trains were not as good as they used to be. Fortunately, as I mentioned on the home page, the new century has become a new golden age for electric trains. High quality trains are back in production and some of the new stuff that Lionel is cranking out is just as good or even better than the original stuff. The only difference is that now all the stuff is made if China instead of here. But if you ask me, I think moving the manufacturing the China was one factor that made this new golden age possible. With lower productions costs, train makers are able to make high quality items for reasonable prices once again. Q: I hear all these terms like "O, O-27, O-31, O-45, O-72 " etc. What do these terms mean? A: These terms and numbers might be confusing at first, but they are actually quite simple. Let's start wit ht the "O" in all these terms. The O simply stands for O-gauge. The O scale was originally invented by Marklin trains around 1900, but Lionel took it big time. From what I've read, they called it O scale because it was smaller than the existing "1" scale (also known as wide scale) at the time. Anyway, the number next to the O is a direct representation of the diameter of a completed circle of track. So, a completed circle of O-27 track measures 27 inches across. Standard O-gauge track is O-31, meaning that it's 31 inches across a completed circle of track. O-45 is 45 inches across and so on. This comes into play when you consider the scale of trains you are running, how realistic you want your layout to look and also how much space you have to work with. Since a turn of O-27 track only requires 27 inches, you can have a lot more train in a smaller space. But the tradeoff is that O-27 is not as realistic looking as standard O. With standard O, you get a more realistic looking scale, but you've also got to have a lot more space to make those big turns. If you want to learn more about this, check out this wikipedia article about it and all your questions will be answered. Q: What is a "truck"? A: When I make mention to a truck or trucks on this site, it should be obvious that I'm not talking about an automobile. A truck is a set of wheels on a train car. Most cars have 2 axles per truck (resulting in 4 wheels) and 2 trucks per car. Some larger train cars may have 6 wheels per truck or even 8. The truck contains the wheels and the coupler that connects one car to another, and may also contain devices used to harness the track's electricity for use on the car (lights, motors etc.) These devices are usually in the form of a shoe or a roller. A car's trucks easily encounter the most wear and tear of any part of the car. The wheels are constantly rolling around the track, the couplers are opening and closing, trucks from other cars are slamming into a car's couplers all the time and when a train accident happens the trucks usually take most of the blow. For this reason, a truck that is made from die-cast metal is the most durable kind. Plastic trucks and couplers are far more vulnerable to breakage or damage when an accident takes place or even under normal wear and tear. Additionally, a die-cast truck is heavier and gives the car more stability and strength than its plastic counterpart. Not surprisingly, most of the lower end O-scale trains made by Lionel and other companies use plastic trucks. The highly collectible "postwar" era Lionel trains were so good, in part, because of the sturdy and reliable metal trucks. During the 70's and 80's it got pretty hard to find many cars with die-cast trucks as Lionel worked to cut production costs. However, since the mid 90's, competition has forced a return to higher standards of quality and die-cast trucks are becoming more and more common again. One significant improvement that has been made on die-cast trucks since the postwar days is the advent of "sprung" trucks. Instead of the truck simply having a metal mold of the spring-like shocks that a real train would have, many new die-cast trucks have real springs incorporated into them. This gives the car a more realistic look and also makes for a smoother riding train. Q: How many companies make O-gauge trains? A: There are lots. Obviously, Lionel is the best known because they've been around since the turn of the 20th century. Lionel didn't invent O-gauge, but they've been making O-gauge stuff since 1900. Since then, many competitors have come into play. As far as I know, there are 5 major O gauge train makers today. Yes, there a lot more than 5 companies that make O-gauge trains but I'm just talking about the major brands that you see on most train store shelves. The major players appear to be Lionel/K-Line/American Flyer, M.T.H/Railking, Atlas, Weaver, and Williams. Lionel is obviously the classic choice and usually makes a good starting point for people who are new to the hobby. Lionel absorbed train makers American Flyer and K-Line, but they still put out unique products under those names. MTH (Mike's Train House), which can also be found under the Railking name, makes very high quality trains and is probably my personal favorite overall. MTH's Premier Line offers the high end scale products while RailKing offers the more affordable O-27 products that fans of Postwar Lionel stuff will enjoy. Atlas makes incredibly detailed trains with incredible craftsmanship. Weaver trains are detailed well, but they are very delicate, so I wouldn't get them for children. Williams tends to specialize in making reproductions of classic postwar-era trains. You can find examples of most of these brands on my modern trains page. If you pick up any modeling magazine, you can find plenty of other smaller manufacturers as well, such as 3rd Rail, Red Caboose, Ready Made Toys. SMR and many others. I can't really say which train maker is "better", since that's really a matter of opinion and taste. They are all the same gauge, but each manufacturer has a style that's all their own. The important thing to remember is that you DO NOT have to use a single brand on your layout. Nearly ALL O gauge trains will operate with each other so you can mix and match all you want. Q: How many companies make O-gauge accessories? A: Tons. All of the major train makers make accessories too, be they track side or otherwise. However, some of the coolest and unique accessories are the ones made by small companies and even individuals. You can find advertisements for the smaller manufacturers in just about any train modeling magazine. My favorite magazine is O-Gauge Rail-Roading. Just like the trains, you can mix and match accessories from different companies so don't be afraid to sample various brands. In terms of controlling the accessories that you have, you can either use the traditional wiring method and have a master control panel where buttons and switches are pushed and thrown OR can you save space and time by wiring them all up for remote control. I'm currently using a AIU (Accessory Interface Unit) made my MTH to control my accessories. You simply plug each accessory's power supply into an AIU port and then you can control that accessory from the DCS remote control (purchased separately). You also need a TIU (Track Interface Unit), which is the core of the system. The TIU + Remote Control combo package runs around $300, and the AIU runs about $100. Each AIU can handle up to 20 accessories and you can connect up to 5 AIU's to one TIU. Q: Who makes the best O-gauge trains and accessories? A: This is something that's 100% opinion based. It all depends on what your tastes are and what you look for in the trains/accessories that you buy. Personally, I don't really have a definite favorite. Most of my set is MTH these days, but I enjoy adding pieces from Lionel, Atlas, Weaver and other manufacturers as well. Truthfully, I tend to go through phases. I'll buy all MTH for a while, and then it's nothing but Atlas stuff for a few months and so on and so on. This is strictly my opinion, but I see the difference manufacturers like this: MTH makes great stuff and I like them because they make a lot of modern equipment. Lionel makes great stuff, but they seem to me to focus more on the past with big steamers, sleek diesels and older rolling stock. When they do make modern items, they are always nice. Atlas makes a good mix of everything and I like their attention to detail. In general, I find Atlas to have more detail than Lionel or MTH. Weaver strikes me as being for the serious modeler. They use styrene plastic, which takes paint well and customizes better than the ABS plastic that other manufacturers use. They also sell almost every car in an undecorated version, thus allowing complete customization to the modeler's tastes. The styrene plastic seems to make Weaver models much more fragile than MTH, Atlas or Lionel products. So, like I said, Weaver is more for the serious modeler. Again, this is all my opinion and everyone has their own views. The best answer I can give is this: There isn't really anyone who makes BAD trains and accessories. Find what makes you happy and go for it! Q: What type of track do you use on your layout? A: I'm using nickel-silver O-scale track made by Atlas. I'm also using Atlas switches as well. It wasn't easy to make this switch, as my original set was 100% Lionel O-27 track. But I bit the bullet and decided to upgrade to a more realistic looking track that could handle the larger (and nicer) O-scale engines and rolling stock. Q: What size of curves does your current layout use? A: The most commonly used curve on my current layout is O-72. The tightest curve is a loop of O-63 in the rail yard. The widest curve so far is O-81. I've cheated a bit and slipped in a couple O-54 curves in places where they won't be visible, but don't tell anyone. If you don't know what the O-54, O-72 and O-63 terms mean, click here. Q: What sort of scenic supplies do you use? A: My scenic supplies are pretty much a combination of 2 brands. For general ground cover, grasses, trees, shrubs and other plantlife, I use Woodland Scenics materials. Woodland Scenics makes great stuff and the people there are always a pleasure to deal with. I also use Brennan's Model Railroading Products for some of the more detailed ground cover and for track ballast. Brennan's "Better Ballast" is the best ballast I've ever seen and his ground cover materials are equally great. He makes several other items which I will probably use in the future as well. Dennis Brennan is a really nice guy too, and I highly reccomend his stuff. Q: What transformers/power supplies do you use and/or recommend? Q: I'm new to this hobby and I want to get a train for myself or my child. Where do I start? A: The two largest train makers, Lionel and MTH, both make fine starter sets that are ideal for anyone just getting into the hobby. They also make great gifts for children. Starter sets come in a variety of themes. Some are geared toward the classic O-27 trains of the 1950's, while others are built to scale for those who prefer more prototypical operation. Other starter sets are geared for kids, and there are even starter sets that cater to things like football, baseball and NASCAR. Whatever your looking for, you can bet there's a starter set out there for you. Both MTH and Lionel offer starter sets with digital command control. Lionel's system is called TMCC, while MTH's system is called DCS. MTH's DCS equipped starter sets usually go for around $350 or so, while Lionel's are a little more expensive. 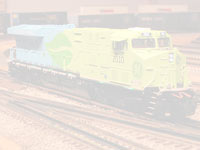 Some of Lionel's cheaper starter sets do NOT include digital command control and offer only the classic conventional operation. It may be tempting to buy one of these non-digital sets as you can usually get one for around $250. I strongly recommend getting a digital command equipped set! Trust me, you'll be a lot happier in the long run if you fork over a little more money and get a set with either DCS or TMCC. Why, you ask? The answer, quite frankly, is that conventional sets are boring. This is especially true if you're getting the set for a child. Children growing up with video games and the internet will be totally bored with a conventional set in no time at all. A few laps around the track and that's pretty much it. You've seen all the set can do and there's nowhere to go from there. Digital command controlled sets are much more exciting and they simply do more. They sound like the real thing, they smoke like the real thing and they can do so many other cool things that I won't list here. Yes, it's true that in order to harness all of the digital extras you will need to purchase the command base for each respective system (For Lionel it's the TMCC command base. For MTH it's the DCS TIU device.) and that costs extra money, but you really don't have to worry about that right away. All digital systems will automatically run conventionally in the absence of the command base. This means that you can start of conventionally and then add the command base at a later time. Once you buy a conventional set, it will always be conventional. A digital set, however, can either be conventional or digital so it's a win-win situation. What's more is that with MTH's DCS equipped engines, you can use some of the digital effect without having the TIU command base. Their engines come with instructions that tell you how to access certain commands using a combination of whistle and horn button pushes! So, my point is...GET A DIGITAL COMMAND EQUIPPED SET. You won't regret it and it will provide you with years of entertainment. My personal favorite is MTH's DCS system. I like it better than Lionel's TMCC system for 3 main reasons. First and foremost, the DCS command base will also control any TMCC equipped items you may ever have. This means you don't HAVE to have all MTH engines. You can have Lionel TMCC engines on your layout and still control them via the DCS system as well as run them on the same track. Lionel's TMCC lacks this ability. If you go with TMCC and you ever want to add any MTH DCS equipped engines you will have to buy all the DCS hardware to get them running. With DCS you get the best of both worlds. Secondly, the remote control for DCS is much easier to use (in my opinion). Lastly, all updates to the DCS software are always available for FREE on MTH's website for download and installation. This means you can update your system to get the latest features without having to buy new hardware. Of course, some people are die-hard TMCC fans and that's fine. In the end it's really a personal opinion. Anyway, I hope my answer was helpful. If you have any further questions, let me know via email. Q: I like one or more of your train photos and/or videos and would like to use it for my own purposes. Is that allowed? A: If you'd like to use any of my photographs or videos for non-profit or personal use, feel free do so. I only ask that you give me credit for the photograph or video. If you're looking to use one of photographs for commercial for-profit purposes, please email me first and ask my permission. Chances are I will be cool with it, but just ask first. Thanks! Q: How do you afford all this stuff? What do you do for a living? A: I don't drink and I don't smoke. Trains are my only vice. I work in computers for a living. Q: I would really like to come see your layout in person. Do you allow this? A: Yes. I normally have at least 1 public open house per year, usually in the fall in either October or November. The open house is part of a tour of Atlanta and North Georgia area train layouts called The Piedmont Pilgrimage. It's free of charge and open to the public. Check out the Piedmont Pilgrimage website for more information, including dates and directions. Q: What's the best way to get in contact with Eric? A: I've found that the best way to reach me is to message me on facebook. If you don't want to use facebook, you can always email me but it may take longer for me to get back to you as I get a lot of emails. Facebook is your best bet for a timely response.